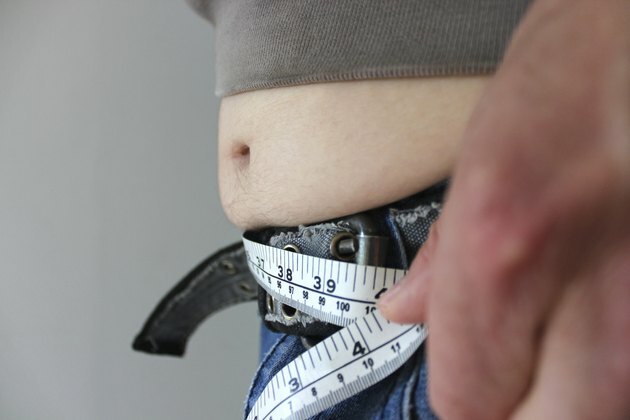 If you're an adult male, measuring your waist size regularly can help you keep track of your body condition. Having a waist circumference of more than 40 inches for a man can interfere with an active life, decrease your athletic ability and impact your cardiovascular health and stress level, according to the Centers for Disease Control and Prevention. A progressively larger stomach can be a sign that your fitness program needs to be revamped, whereas a shrinking waist can show a job well done. Remove your shirt or pull it up and secure it above your belly button. Roll down or lower your pants and underwear to just below the hips. The tape measure needs to be positioned correctly around your waist, which is easier to do with your clothing out of the way. Locate your hip bones by placing your hands on the front of your stomach, just below your belly button. Press into your stomach, gently, and slide your hands down until you feel the top of your hip bones. Wrap a tape measure around your abdomen, just above the top of the hip bones. Make sure the tape measure is even and level all the way around your waist. Pull the tape measure to be snug, yet not squeezing your stomach. Inhale through your nose for a count of three to five. Exhale fully from your mouth, again for a count of three to five. Read the measurement on the tape once you have pushed all of the air out of your stomach. Measure your waist once a month to keep track of your weight and progress. Consult with a certified personal trainer to help you put an effective and safe fitness program together. Avoid measuring your stomach immediately after eating; a full stomach may cause the measurement to be elevated. For best results, measure your waist on an empty stomach first thing in the morning. Centers for Disease Control and Prevention: Healthy Weight – It’s Not a Diet, It’s a Lifestyle! World Health Organization: What Are the Health Consequences of Being Overweight?